Huge Savings Item! Free Shipping Included! 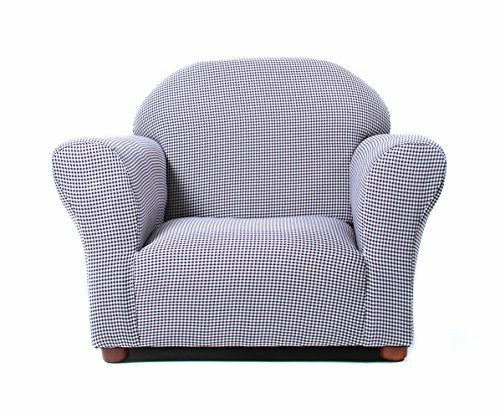 Save 19% on the KEET Roundy Kid's Chair Gingham, Navy by Keet at Indsight. MPN: CR16. Hurry! Limited time offer. Offer valid only while supplies last. NOTE: This is an assorted product; color and print advertised are subjected to vary.The Roundy chair was designed to enhance the beauty of any room. The Roundy chair was designed to enhance the beauty of any room. It is also comfortable and durable; it has a strong wood frame, covered with high density foam to maximize comfort. The Chair is handmade just like an adult piece of furniture with wooden legs. The Beautiful Gingham fabric is easy to coordinate with most room décor. Add a Roundy Chair to any room to create a special place for reading, watching TV or just Relaxing. Your kids will love it. Wooden Legs, for a real furniture look;Measures 24W x 18D x 17H inches. View More In Kids' Furniture. If you have any questions about this product by Keet, contact us by completing and submitting the form below. If you are looking for a specif part number, please include it with your message.